Clergy arrested at McConnell's office for protesting health care bill as "political murder"
Rev. 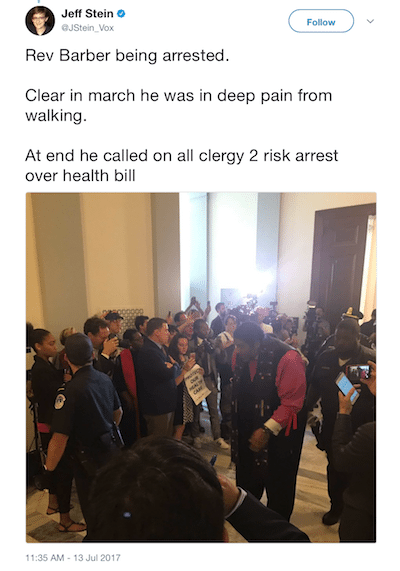 William Barber and other clergy were arrested in the halls of Congress while performing civil disobedience protesting the GOP health care repeal or "death bill." Rev. William Barber led a group of Christian and Jewish clergy to Senate Majority Leader Mitch McConnell's office on Capitol Hill in an act of "Moral Resistance" against the deadly GOP health care repeal bill. Approximately 10 protesters, including Barber, were arrested. Call and response chants of "If we don't get it? Shut it down!" and "What do we want? Health care!" resounded in the air as protesters approached McConnell's office. A rabbi blew a shofar to mark the official beginning of the act of civil disobedience. We are here to make sure that you to do what you were elected to do. As I look at this plaque with your name on it, it says that you represent the people of Kentucky. And I happen to know that the people of Kentucky will suffer if this health care bill passes. You may be OK. Your friends may be OK. But the people who put you in office will suffer because of this bill. It is time to stop calling God by other names when you really want to call God "capitalism." It is time to stop cloaking your greed in religious language. I'm here to tell you that there ain't nothing right about the religion that's happening in these halls. This should be where we come for help. And yet we are coming crying out on behalf of the people to stop some of the most egregious legislation that we have seen in a long time. If you can turn your backs on 22 [million] additional people, don't tell me that you are pro-life. If you can turn your backs on people who are suffering from conditions that will no longer be able to be treated, don't tell me you are pro-life. Rev. Jennifer Butler, CEO of Faith in Public Life, which organized the protest, read from the Bible, intending to give it to McConnell as a "gift," hoping he'll read it. Rev. T. Anthony Spearman spoke about the lives Obamacare has saved. Another clergyman pointedly noted, "When Jesus was on this earth, he never asked how much you could afford to pay before he healed you." Capitol Hill police arrived and forced media covering the protest away from the scene under threat of arrest. Kept at a distance, journalists were unable to record the actual arrests. However, protesters reportedly exclaimed "We shall overcome!" during the process. 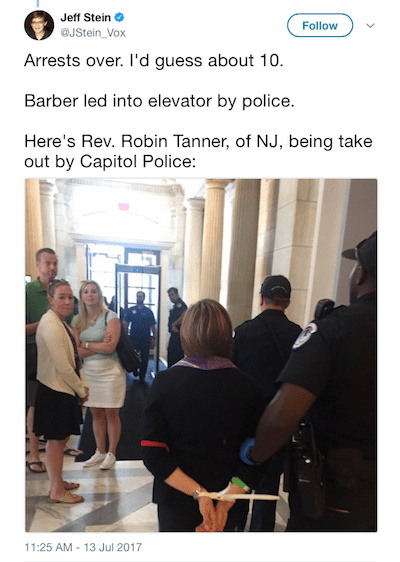 During the protest, Barber tweeted, "Kill the death bill & let the people live!" and decried the Senate health care repeal bill as an act of "political murder" against the poor. Barber is not speaking in hyperbole. The Republican plan will strip health care from millions of the most vulnerable Americans. Countless millions will be harmed, and tens of thousands of people will die every year as a result of this bill's passage. The Republicans know this. Donald Trump, McConnell, Paul Ryan, and other GOP lawmakers simply value the $33 billion tax cuts they are providing to the wealthiest 400 households in the United States more than they do the lives of regular Americans. Previous articleNewly released security document confirms Jeff Sessions "successfully misled the FBI"